Any camp related questions may be directed to Coach Brian Hills at bchatl@rit.edu or 585-475-3850. Please contact your youth hockey first if your team is registering as a group. Any camp related questions may be directed to Coach Chad Davis at cadatl@rit.edu. The RIT Women’s Hockey Youth Camp is designed to be a fun environment to learn the game for girls in grades 1-8, ages 7-14. Campers will be instructed by RIT Women's Hockey NCAA coaches and players in skills including skating, puck handling, and passing, as well as play small arena games. The RIT Women’s Hockey Development Camp is designed to educate girls on what it takes to play at the NCAA level for high school girls in grades 9-12. There will be attention to detail in skill development with all instruction provided by RIT Women's Hockey NCAA coaches and players. There are limited spots at each position. Come and join us for a first class experience! The Tiger Hockey School is in its 20th year of operation and is considered the premier hockey school in the Rochester area. This summer, the Tiger Hockey School will be held again in RIT's Gene Polisseni Center, one of the top college hockey arenas in the country. Campers will actually gain a feel for what is is like to play in a big-time arena and hopefully dream of someday playing for the RIT Tigers. The RIT coaches and staff know what to teach, how to teach it, and they have fun with the kids! "After several years of participating in the Tiger Hockey School, my son benefited every season from the direction and coaching the hockey school offered. 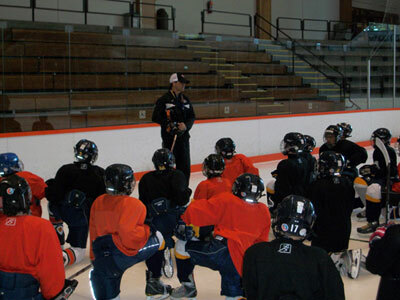 Tiger Hockey School is the answer for gearing up your season and getting your game in shape for the coming season. You get the benefit of Division I coaching, a great college facility and a range of on and off-ice activities to keep your kids moving all day. Give your son/daughter an edge to starting their hockey season with a bang! I highly recommend it"
"The coaching and enthusiasm of the coaches and counselors at the Tiger Hockey School is second to none. My kids have been to several different hockey schools over the years and the Tiger Hockey School was by far the best from an instructional standpoint and my kids really did have fun. It was always funny to see how tuckered out they were at the end of each day of camp, but also how excited they were about the day they had just experienced." Testimonial from Coach Jim Hofford. Jim Hofford is a former Rochester American and has been one of the area's premier youth hockey coaches. 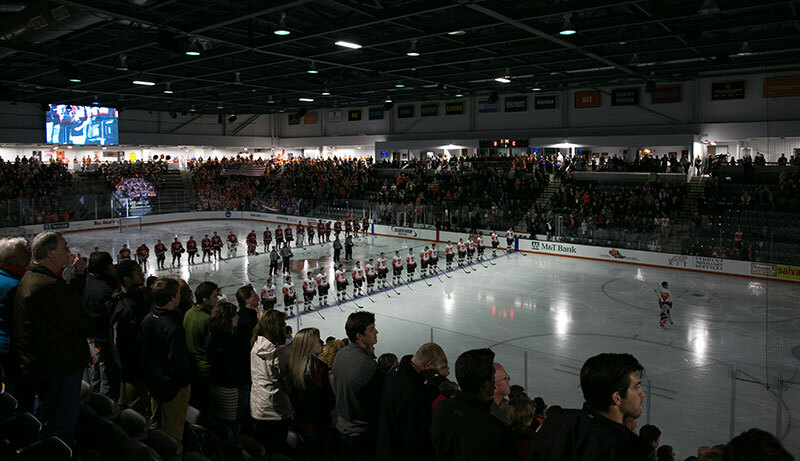 "Over the years, I have had my teams attend the RIT Hockey School as a kick-off to our season. Prior to each camp, I sat down with Coach Hills and was able to give him some insight into my team and our goals for the week. We talk with the coaches each day about how camp went and they would let me know what went well and if there were areas that we needed to really work on with our players. I feel that attending this camp was always very beneficial and it has worked well for my teams.